WSWNE celebrates St. David's Day! 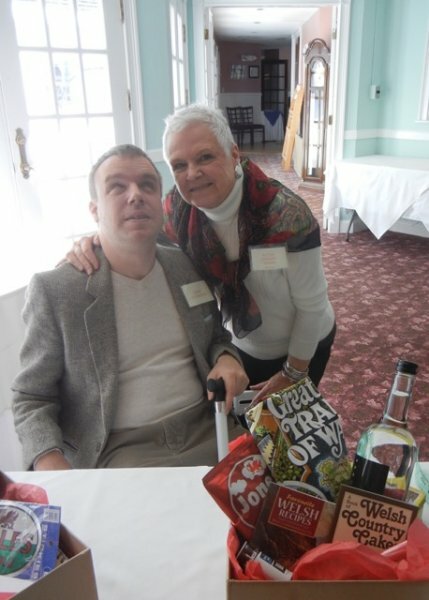 St. David’s Day was celebrated with gusto in East Windsor, Connecticut this pastMarch 7th by the Welsh Society of Western New England. The Nutmeg Restaurant was the lovely setting for the Welsh gathering, lunch, annual business meeting of WSWNE, and excellent talk and slide presentation on the history of Plaid Cymru by board member Shirley Gilmartin. A large bouquet of daffodils graced the entrance, as did welcoming words and embraces. Susan Davies Sit, president of the society, had recently returned from Wales and had brought back gifts, including a child’s rugby ball, that were all part of the Welsh “Tea cup” auction. Other items including Welsh notecards, Welsh flag tee shirts and bags were also available for purchase. 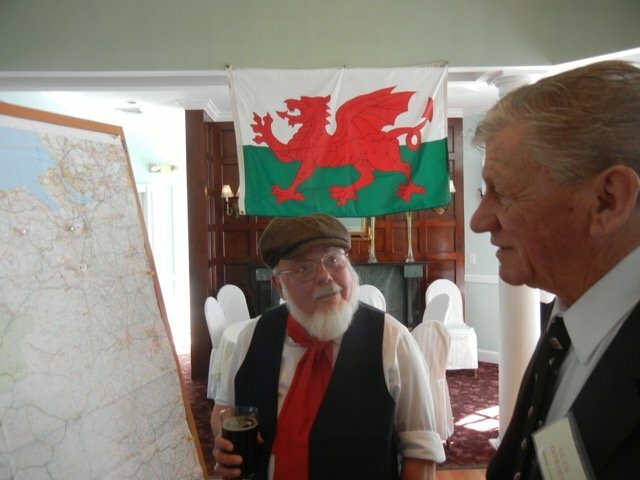 A large map of Wales was on display with pins showing the origins of members’ Welsh roots and members delighted in sharing their Welsh roots with others. And Ed and Beth Brown added a delightful presence dressed in traditional Welsh clothing. He wore slate quarry miners work clothes and cap, and she with long country dress, apron, and tall black hat, still traditionally seen in Wales by women on St. David’s Day. Amid lively conversation The Nutmeg prepared a delicious lunch starting with leek soup, a choice of entree, accompanied by bottles of Llanllyr Source spring water from West Wales. Shirley Gilmartin’s talk was riveting as she shared from the book Gwynfor Evans, Portrait of a Patriot, by Rhys Evans, and also of her personal involvement during the resurgence of Welsh nationalism as a youth growing up in Wales. She also shared the emotionally charged story of the flooding of the Tryweryn Valley and the role Plaid Cymru played as well as its role in the establishment of a Welsh language TV channel S4C and Radio Cymru. The warmth of old friends and new ones made, gave this annual tradition a special day to remember. We closed with the singing of the Welsh national anthem and as always, look forward to future Welsh gatherings.